Workers in northern Europe are more likely than their southern counterparts to take sick leave, a study has found. Workers in Ireland, Greece and Portugal take the least time off for illness, the study found. On average, 14.5% of European workers took at least one day off in 2000, the year covered by the study. Greece had the lowest rate of absenteeism at 6.7% and Finland the highest at 24%. 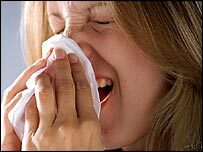 "This study provides the first scientifically valid description of sickness absence across EU countries," said Dr David Gimeno of the University of Texas School of Public Health in Houston. The survey looked at absenteeism and ill health in 2000 in the then 15 members of the European Union (EU). The EU has expanded to 25 members since the survey was carried out. Sick leave - real and feigned - currently costs UK businesses an estimated £11bn a year. It is widely perceived to be higher in the public sector than in the private sector, though there is evidence to suggest that absenteeism in large private sector companies matches that in the public sector. Research carried out by the Confederation of British Industry (CBI) indicates that small firms, where an employee calling in sick often has to talk to the owner, suffer far less absence than large firms.